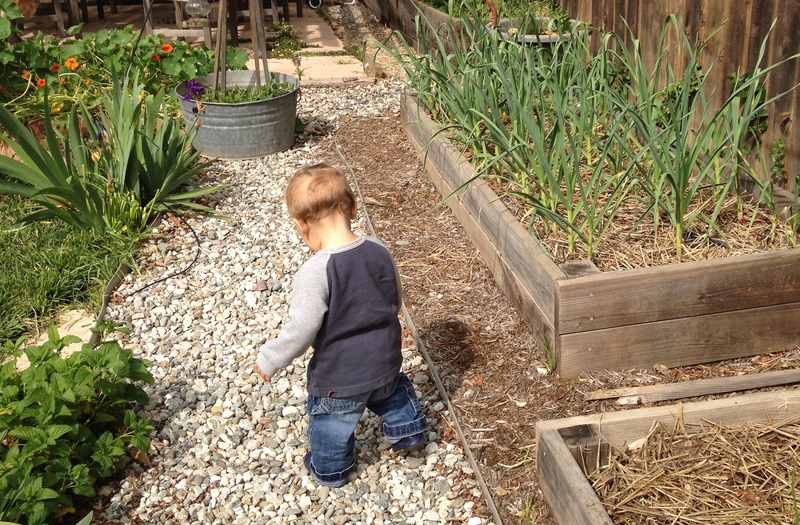 H, my 1 year old, taking a stroll up "the path." I often find myself gardening in whatever I am wearing, even if I am in my “nice” jeans. I do often manage to kick off my clogs and slip on my Sloggers, but that is usually as far as I get into “work” clothes. I don’t usually get to plan when I will work in the garden. I steal moments while my children are happily playing outside or when my son is napping and my daughter swings in the hammock chair or is at school. I used to think I didn’t have enough time to really garden, to do everything that needed to get done, but now I know better. I can get a lot done in 15 minute increments, even though I am still surprised that sometimes that is all I need. I came to this realization about gardening just a few days ago as I put four tomato plants into the ground. The next day it was cucumbers and eggplant. This idea of only spending 15 minutes doing something is not new, but I never really paid much attention until I was looking for a way to manage the household chores and found the “Fly Lady.” She is a huge proponent of routines and keeping the time spent doing household chores to a minimum. I have followed her loosely for about a year and discovered that I had taken the 15 minute mindset, somewhat unconsciously, out into the garden. And, it is working. I now know I don’t have to wait for a huge block of time to do most things. I can just break the chores down into smaller jobs, do them when I can, and have a thriving garden.